Our lives are full of entanglements, many of our own creation. A mini-quest into the forest can often help us to sort it all out. 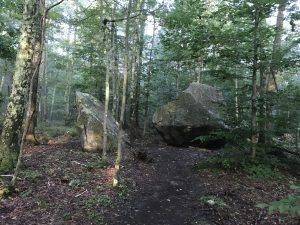 Perhaps a mere coincidence that the other day, I found myself pondering the tangled webs of life and decided to spend a few days hiking in the forest. And what was waiting for me there? Endless spider webs; delicate and swaying in the wind. Coincidence? I think not. I’m incredibly grateful to be near so many hiking paths where one can quickly escape into the woods and back country. 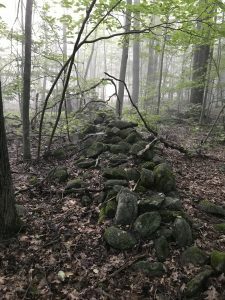 While hiking trails are common all over the world, New England has some wonderful scenery and stone walls hiding in the second growth forests grown up long after the land was cleared for agriculture, then abandoned to nature again. 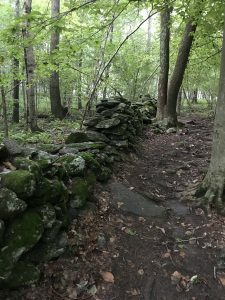 And, for those appreciating Fall foliage, I highly recommend visiting and hiking in Connecticut. The colors are every bit as spectacular as found in Vermont, but without the crowds. Just be sure to wear orange (for yourself and any furry companion) when hiking during hinting season since many State forests are open to public hunting. I’ll be posting some views of the brightly colored foliage soon as the leaves start to turn and fall. So what else did I find on this mini-quest? The morning sunshine sneaking through the canopy as the hand of God. A turtle crossing the fire road. This one was a little timid though. And did I sort out all the entanglements? Not completely, but a valuable lesson learned that life is full of intricacies, and all part of a delicate balance. Feel free to contact me for information about visiting the forests of New England or any other place described here.